Some time ago, I covered a legendary meeting between the two worst Starcraft II players I have ever seen, burnout and TimeTraveler. They had a dispute about which one was not the worst player out of the little circle of family members/friend that I had assembled to play Starcraft. Vetharest and I had agreed that TimeTraveler was easily worse, as burnout was far better at FPS video games and minecraft, but when they faced off, TimeTraveler took an epic TvT that featured the first expansion being built at 28 minutes, battlecruisers, nukes, and epic lack of micro and macro. As I was the main reason any of us were playing SC2 at all, I thought that when I returned to college for the second semester the others would slowly stop playing. This happily turned out to not be the case. Over the weekend, Vetharest messaged me on Skype solely to inform me that these two players were battling it out again, and this time it was random versus random. I didn't have high expectations. Too much could go wrong. Could burnout play anything besides Terran? What if TimeTraveler got Zerg? They would be crushed. However, this rematch turned out to exceed the sheer quality and hilarity of the previous game, as impossible as that may seem. For some reason, Vetharest decreed that both players would play on Catallena, a three player map. The problem is, these two players are extremely casual and don't know much about the maps, so their opponent spawning on the left will endlessly confuse them if they spawn, say, in the bottom right. Speaking of which, burnout spawned at the left-hand position, and TimeTraveler found himself in the bottom right. Both players got their best races (and in burnout's case, the only race he can play). I was not around to watch the game, but Vetharest live reported it (he's going to be a LR bonjwa in a few years, obviously) and sent me the replay to battle report after I agreed that the game sounded completely impossible and ridiculous. TimeTraveler has been brushing up on his builds, and decides to go gas first for a tech-heavy opening. 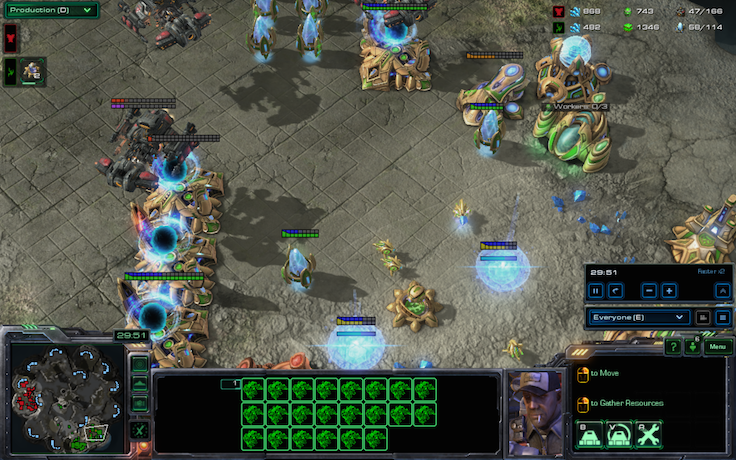 He also wants to play economically, so he gets two pylons up quickly so that he can build continuous probes. 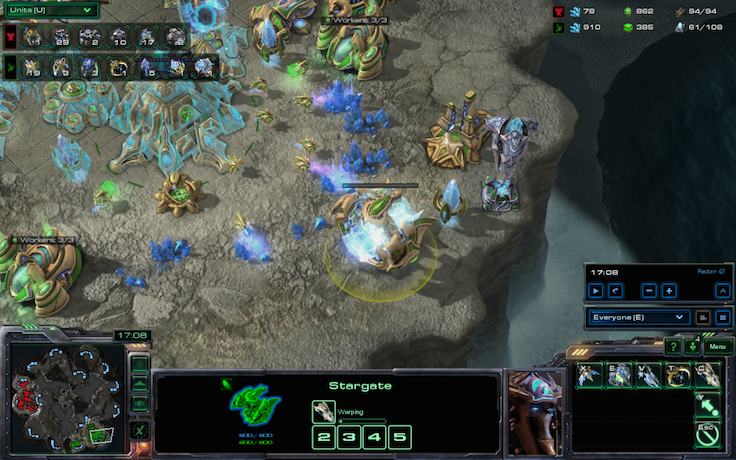 TimeTraveler is conscious of the possibility of a "macro" game, so he gets a quick forge with his cybernetics core. He also skips a zealot. Burnout is cleverly not getting supply blocked by building extra supply depots ahead of time. Meanwhile, he techs to factory. Here, TimeTraveler unveils the first piece of interest in the game. He got a stargate and a twilight council before building an oracle. If a pro was playing this game, he might be going for some sort of oracle + blink play off of one base. Let's see if TimeTraveler is actually MC. TimeTraveler does something pretty smart here. He knows that his plan for this game will require a lot of gas and not a whole lot of minerals, so when he builds his assimilator, he immediately assigns three probes to stare at it maliciously until it finishes construction. This is an intelligent plan because bad players will always forget to put probes in gas, or put the wrong number in. In fact, burnout actually spent a lot of time with one worker mining in each refinery earlier. His next move is to build four more gateways. And eight pylons. And a dark shrine. I believe this qualifies as a The_Templar build. Although the simcity is too good to be mine. You may ask at this point, "But Templar! 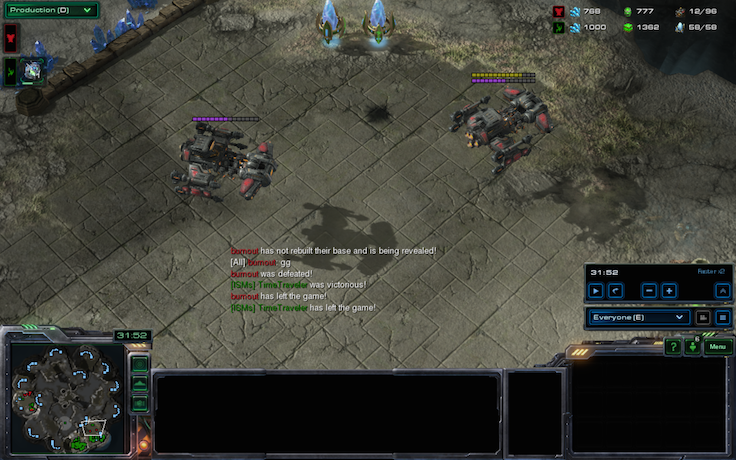 I don't want to read the entire battle report from the viewpoint of some terrible Protoss player! 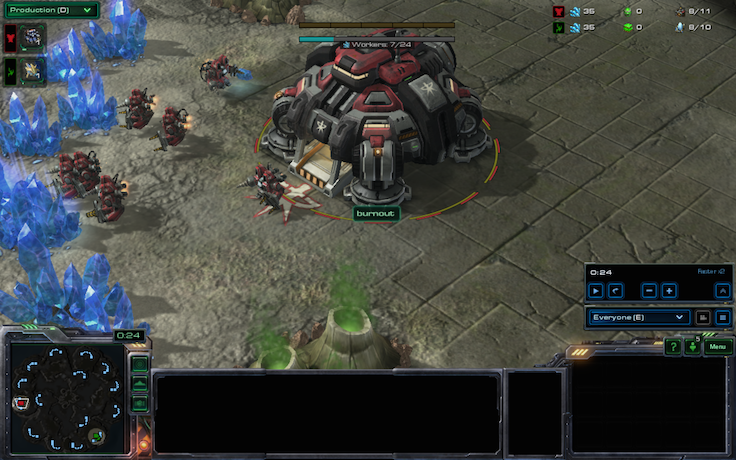 I want to see what's happening on the Terran end of things, I want to know both sides of this horribly executed game." 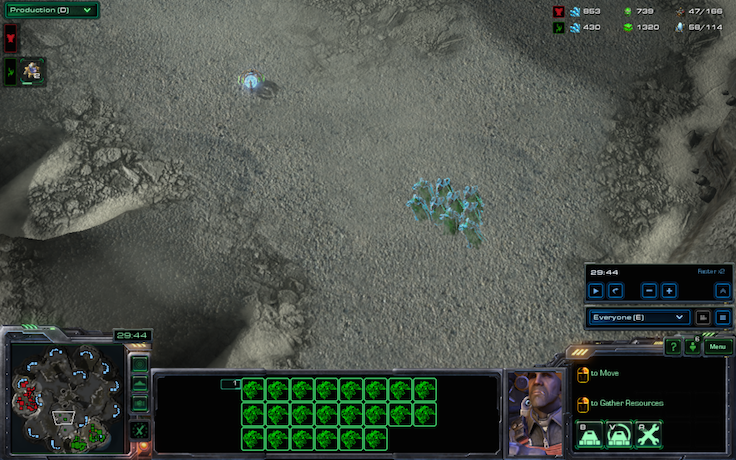 This is reasonable, and in fact you can see that the Terran player is floating 1500/500 on one base before the ten minute mark in the previous picture. However, there IS a reason. Burnout decided to open one base BC. 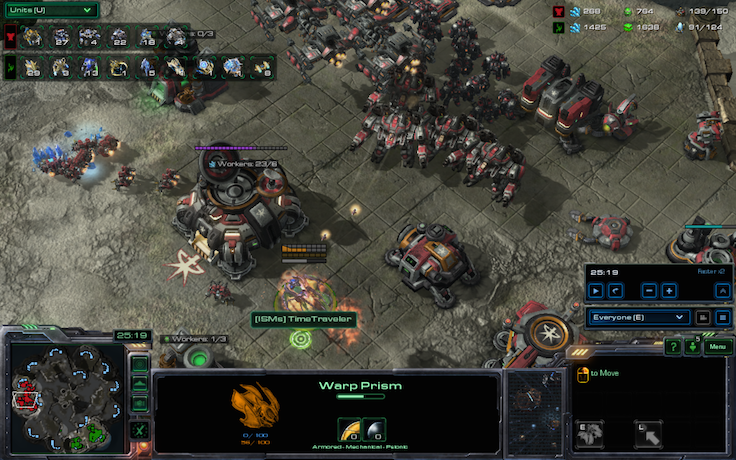 Queueing battlecruisers is my favorite part of playing this game, not going to lie. His plan, however, becomes crystal clear when he builds a mothership. We all saw it coming. With his dark shrine, he will make archons from his DTs. 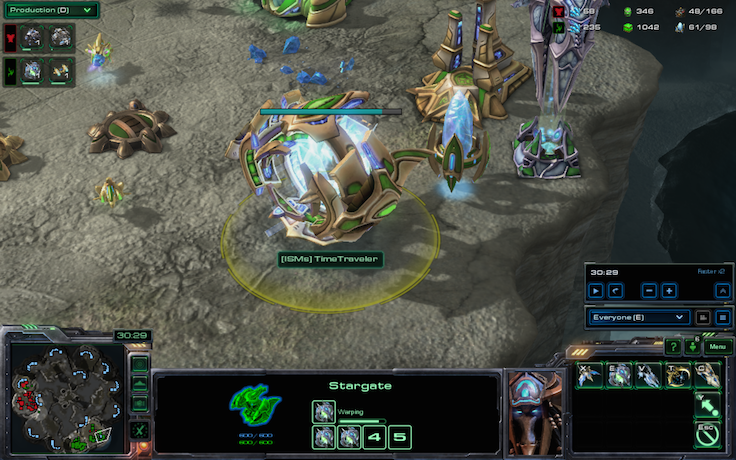 TimeTraveler is going to try a one-base archon toilet! Wait, you can't even do that in HotS. Well then, I don't know. 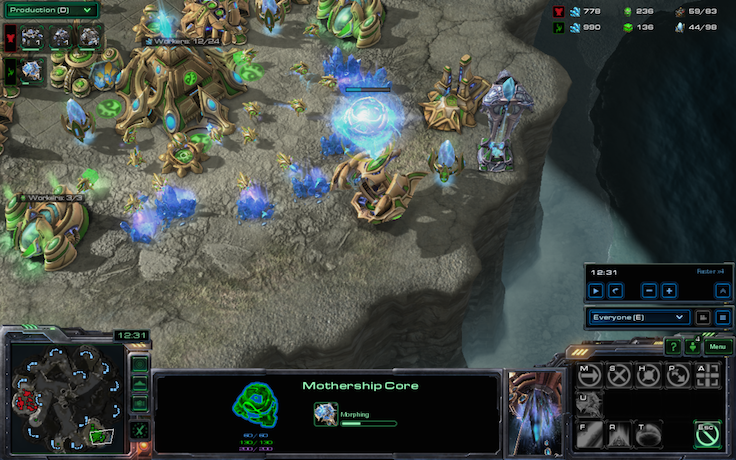 Even I can't win with mothership rush in HotS. You figure it out. 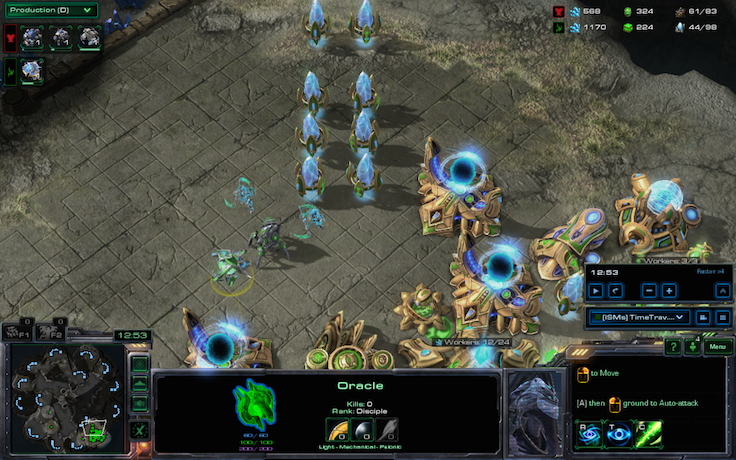 He's also building DTs and an oracle. 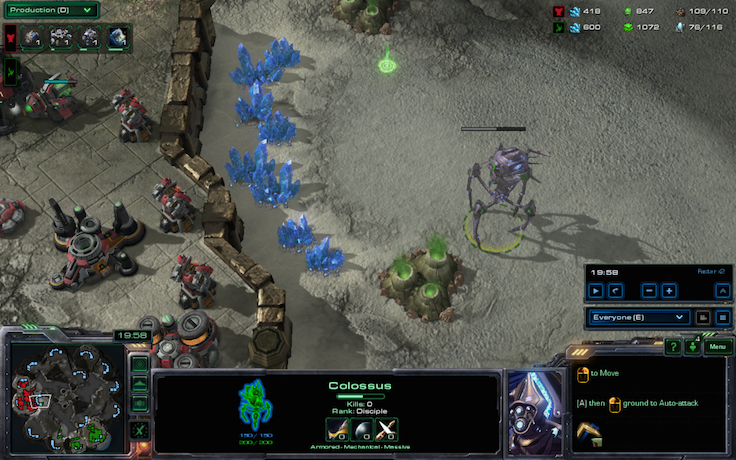 This would be nice, except everything he's got is countered by marines. Fortunately, TimeTraveler is too young to balance whine, and too bad for balance to matter. Look at the minimap in that previous picture. Due to the confusing 3 player nature of the map, TimeTraveler has not actually found burnout's base, even though he's checked almost everywhere with zealots. Yes, he actually scouted. I was also shocked. Eventually, he sends a zealot and finds burnout "fast expanding". For these two players, any expansion before 20 minutes is a fast expansion. 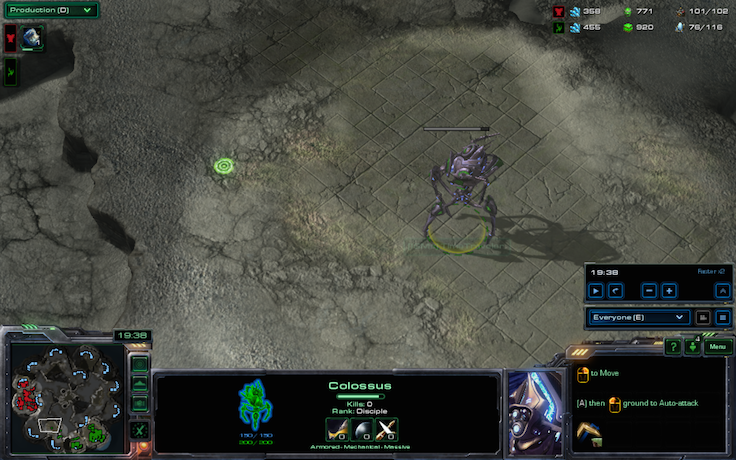 TimeTraveler is itching for a fight, so he attack moves all of his units across the map. This is not good news for the oracle he made earlier on. Was he REALLY going to use that oracle well enough to make it worth it, though? He turns around pretty quickly with his 5 unit army. The mothership, in the meantime, has finished, and a tempest was built out of the stargate while this was happening. Now TimeTraveler is getting a carrier. 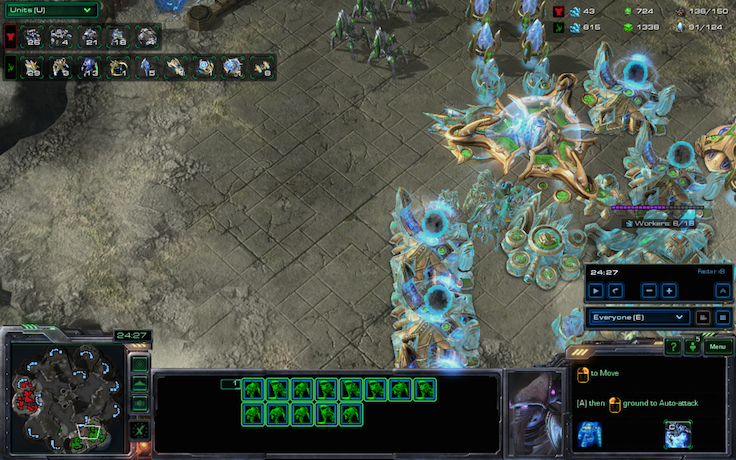 He just needs to make a phoenix and he'll have built every protoss air unit before the 20 minute mark. A new record is incoming, maybe? Burnout had taken note of TimeTraveler's attacking pattern, and cleverly made turrets right where an attack-moved air unit would run if TimeTraveler had misclicked slightly on the minimap when moving out. I don't even know if TimeTraveler uses the minimap. 90% of the reasoning in this blog is theorycraft anyway, so we're going to say he does occasionally. TimeTraveler finds a brilliant tactic using the terrain of the map. He hallucinates a colossus (!) to walk up the cliff into his opponent's main base. By doing so, he will have successfully used special tactics. Hey, it's nearly as effective as a hallucinated phoenix. Burnout can't believe what he's seeing. Just to make sure he understood the severity of the situation, he scans on top of his turrets as soon as they kill the hallucinated phoenix. To be fair, I don't think he ever saw a hallucination before. Since TimeTraveler really wants to scout (something he's never tried before), he sends another hallucinated colossus out. This is totally legitimate. He even puts a sentry closer to his opponent's base to hallucinate colossi. The journey of hallucinated colossus #2: He is set to complete a noble quest. To achieve his goals, he must see some significant part of burnout's forces or tech. Hallucinated colossus #2 knows the errors of his ancestors. He will not run into the horrid turret wall of his opponent. 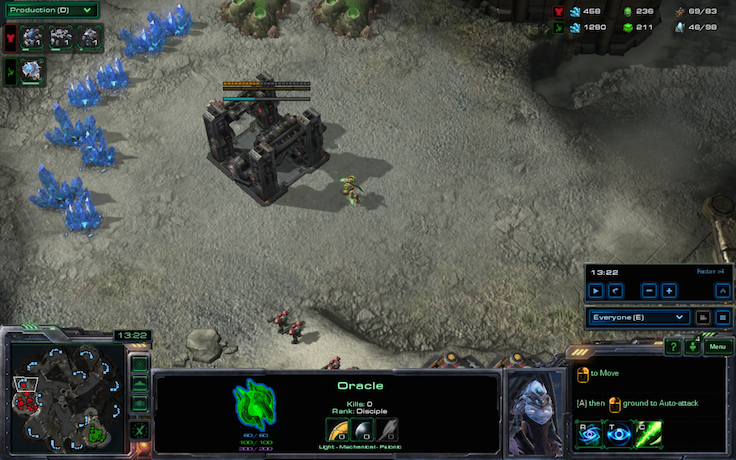 He remembers from the Protoss minds of his proud lineage the secret location of the wretched turret beast. So he just runs into the other turret wall. Wonderful. 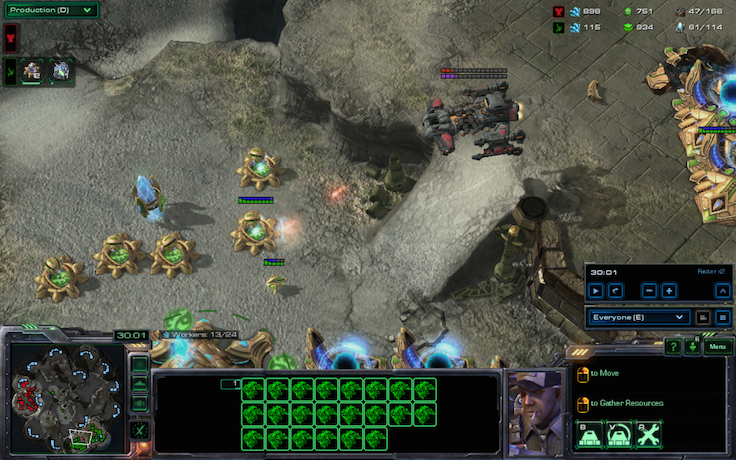 TimeTraveler's next move is to run DTs into the natural, where he had just seen three missile turrets. This could work. Right? ...Right? After killing the marauders stationed there, TimeTraveler snuck past the turrets and went for the marines, but a scan allowed burnout to kill all of the DTs. Still, TimeTraveler embraced Inca, and that's all that really matters. What had TimeTraveler missed with his two hallucinated colossi and DT army? Well, burnout had, in fact, built up a sizable force of battlecruisers, thors, marauders and marines. He hasn't gotten supply blocked very much all game, is saturated on his first base, and isn't floating a ton of money right now. Who knew that a bronze player could macro this well? Let's take a look at TimeTraveler's army. Well okay then. DTs and a mothership, with a few miscellaneous units including a tempest and a carrier thrown in. A slightly bizarre army, to be sure. If TimeTraveler can confuse burnout enough, he can win this game despite being almost 50 supply down. His next move is to send a hallucinated warp prism into burnout's base, which gets a better scout than two hallucinated colossi combined. Confirmed warp prisms > colossi. Will be building 6 warp prisms in all my PvTs now. TimeTraveler attempted additional special tactics by moving a group of four stalkers around the map and blinking down cliffs. This is clearly in order to have fun, but that's okay because they could accidentally do something useful. 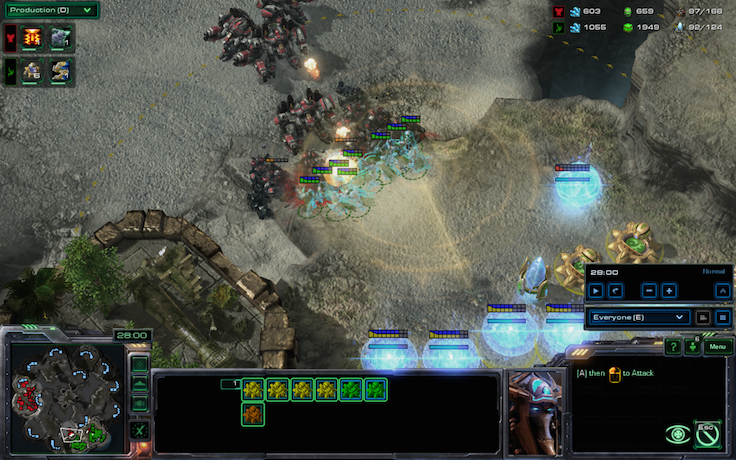 In fact, they see a bunch of battlecruisers moving out! Maybe now TimeTraveler will make units that can shoot battlecruisers. 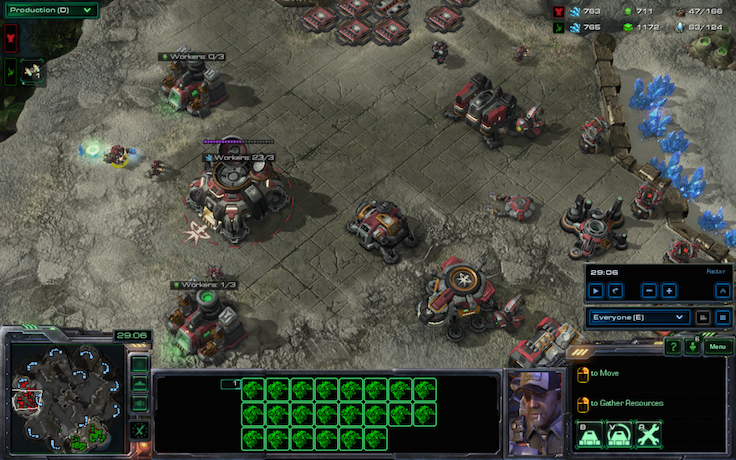 He forgets that stalkers can blink away just in time to lose them all to an equal number of battlecruisers. 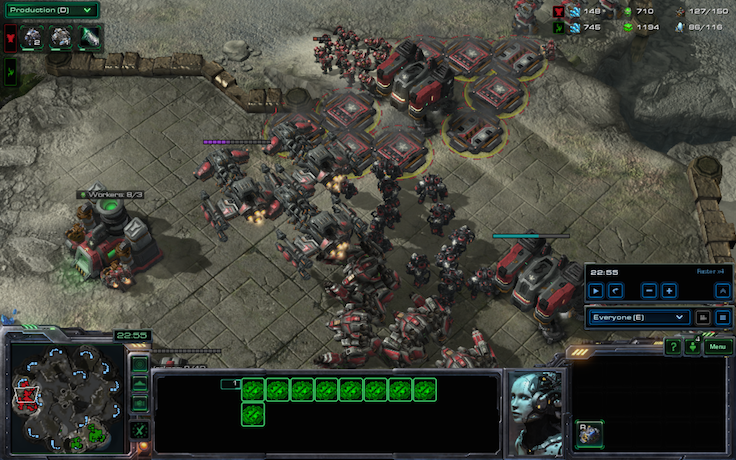 Speaking of battlecruisers, burnout has just decided to move out, and his army is clearly superior. He's 50 supply up on equal workers and his opponent is going mass dark templars with 0 splash damage. How could he possibly lose? 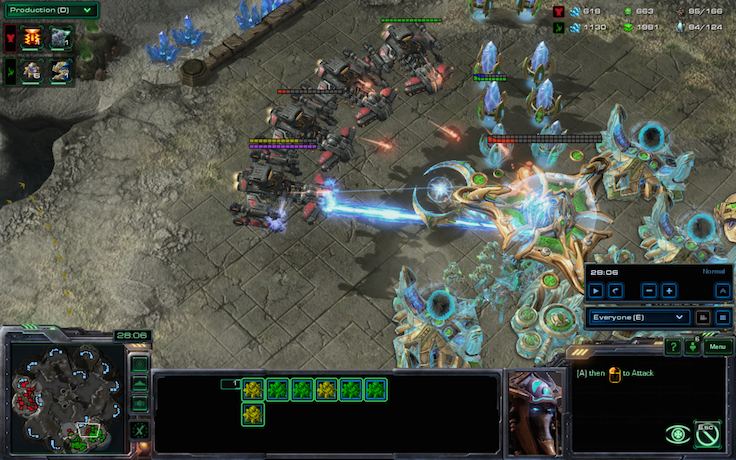 TimeTraveler panics and masses cannons around an Artosis pylon. Normally he does this before he's getting attacked. He does have a lot of DTs though. Can they hold!? Burnout remembers what scans are just in time. ...And the DT army dies in about 10 seconds. 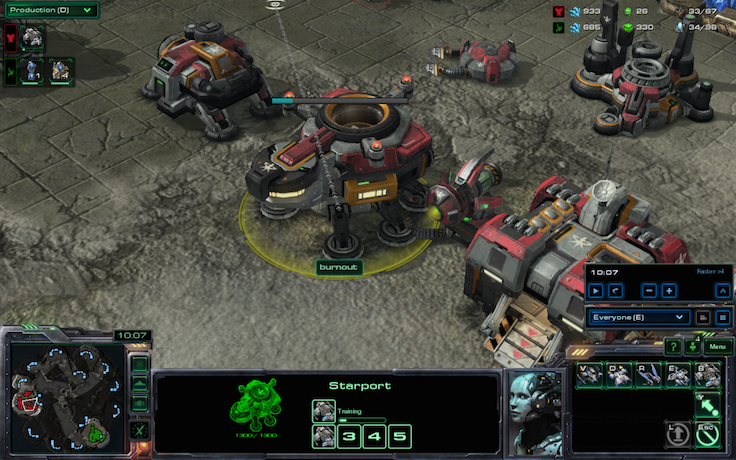 Meanwhile, battlecruisers sneak into the main base. 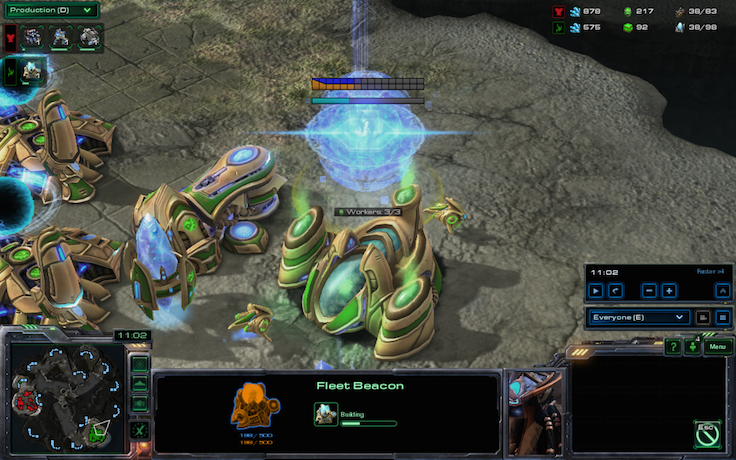 I don't know how four giant war ships reached the center Protoss nexus without huge blaring alarms going off somewhere, but there we are. 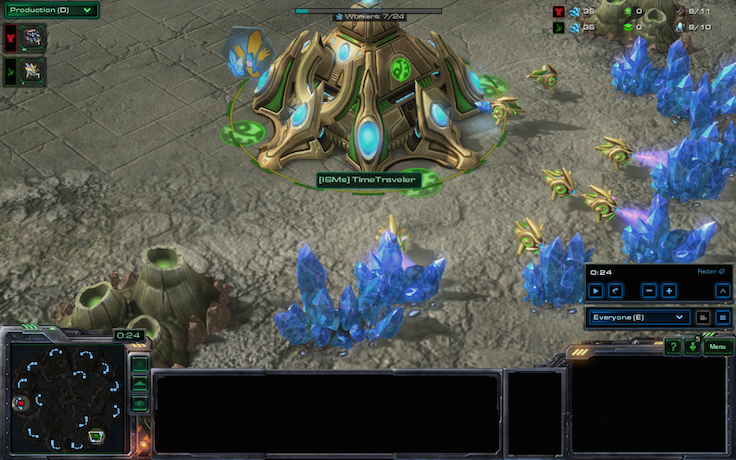 The Protoss mothership is dying and TimeTraveler is being informed that his DTs are under attack. The guy in charge of these announcements should be fired. 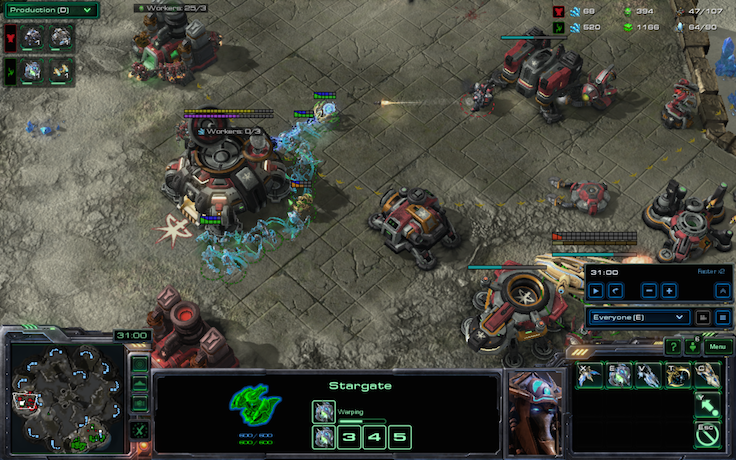 Meanwhile, thors kill reinforcement DTs at the front of TimeTraveler's base. You would think that TimeTraveler might try to get void rays or immortals or something, but I guess warping in ten invisible ninjas in five seconds is easier. Or maybe he's just Inca. A carrier does arrive, and TimeTraveler even micros it against burnout's thors in order to not take as much damage. 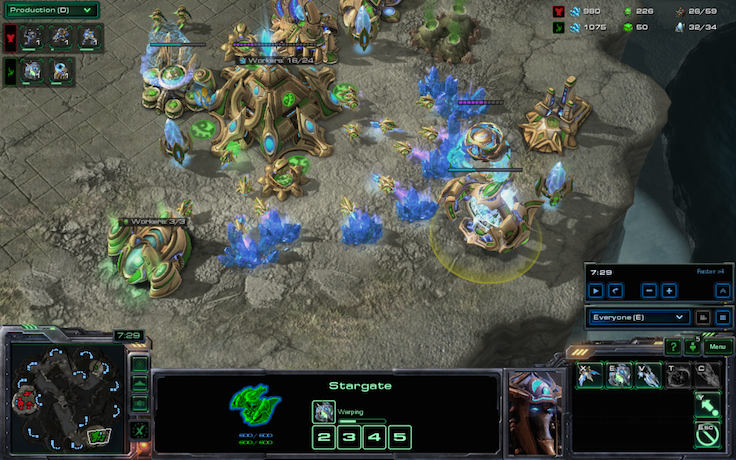 Thus, the first instance of micro appears in this game. 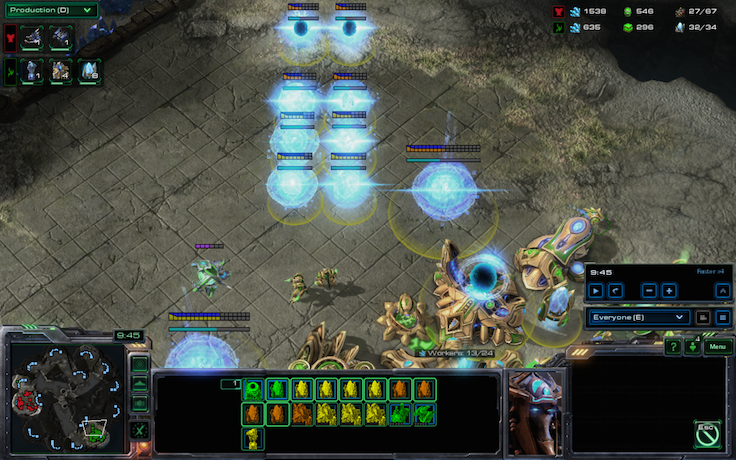 Yamato cannons are launched onto the main nexus. The cybernetics core looks extremely nervous about this. Meanwhile, burnout gets cleaned up by more DTs and carriers. Maybe this is actually the result of some demented funday monday topic. 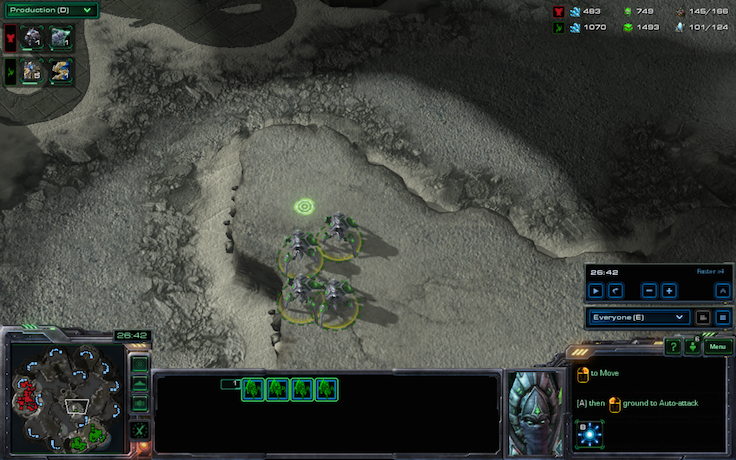 Meanwhile, burnout has been mining with 23 SCVs on one mineral patch while his expansion sits almost untouched with about one SCV on it, so he has no money. TimeTraveler, upon losing his main, desperately moves out with a pack of dark templars and one sentry. This sentry could win him the game. He's still trying to defend with completely random and dumb cannons too. 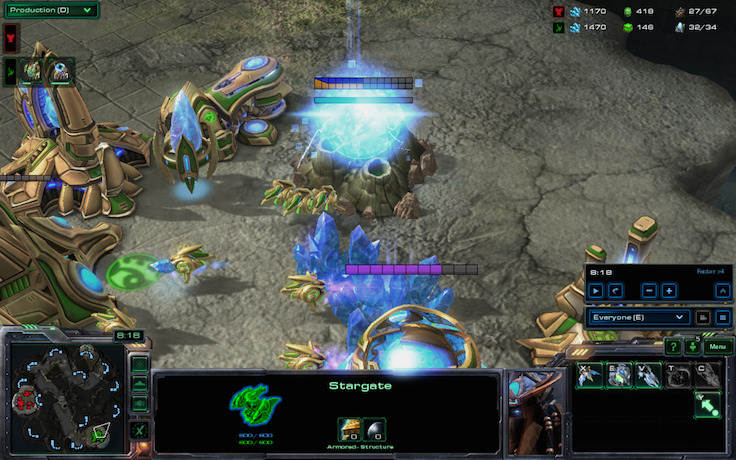 A probe lures one of the battlecruisers into cannons and it dies. 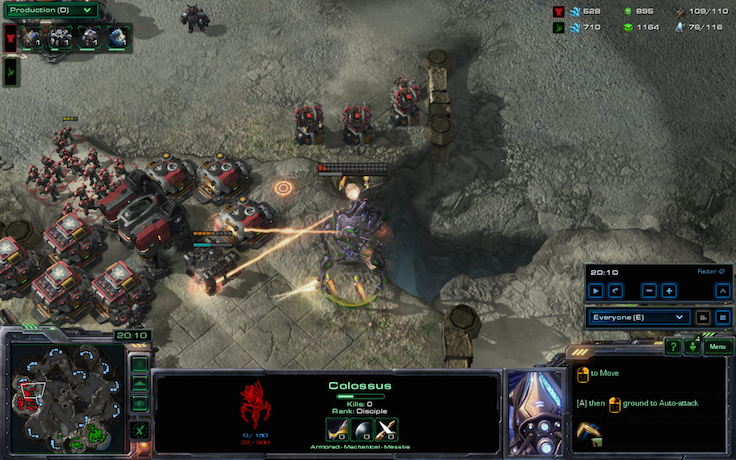 The DTs and sentries arrive at the natural and kill the turrets as revenge for destroying the hallucinated colossus. 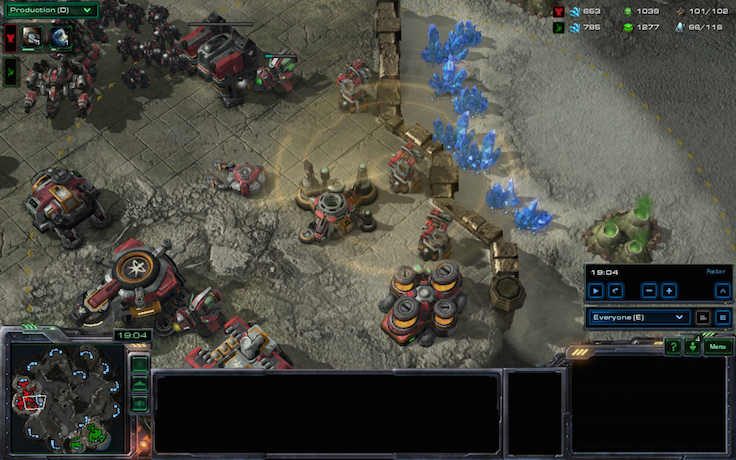 In this extremely tense situation, TimeTraveler decides to make oracles to counter battlecruisers and Terran buildings. 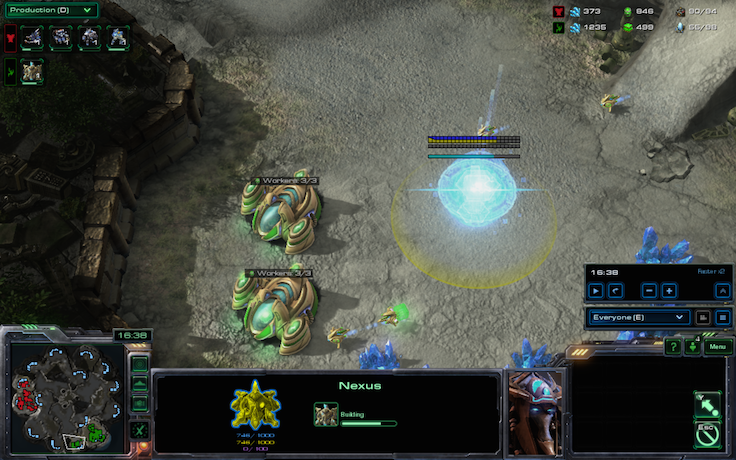 Meanwhile, burnout is not lifting his buildings, nor is he going after the last nexus with the battlecruisers. I'm curious as to what he actually was doing. He's actually making another battlecruiser. A true Templar. 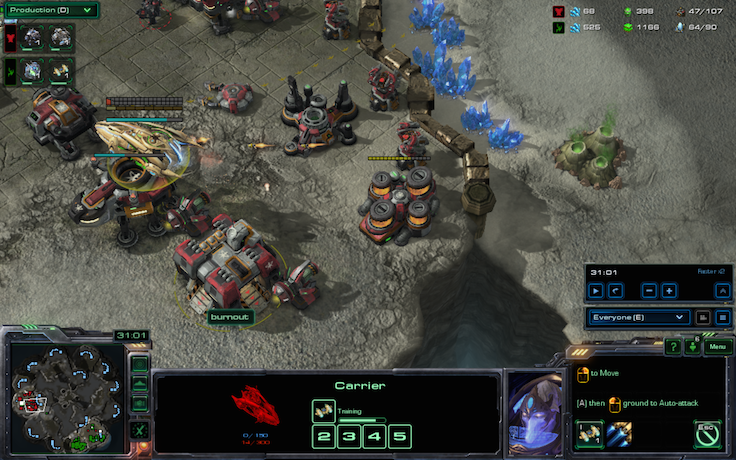 A carrier arrives in the main base of burnout but dies to missile turrets while on move command. Suddenly, the situation becomes clear. 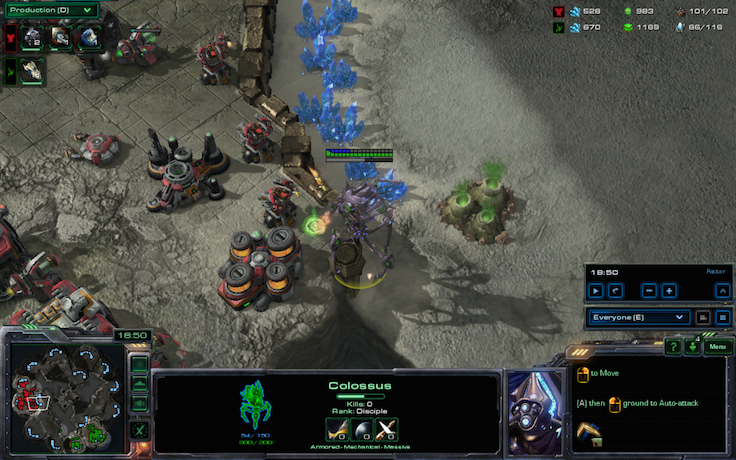 Because TimeTraveler is strategically an idiot, burnout has been given a golden opportunity to eliminate the protoss with his BCs unopposed while lifting his last command center (or really any building) to one of the vast air spaces in the map. Since TimeTraveler only has a sentry and some cannons, this will allow burnout to secure a nearly guaranteed eventual victory. 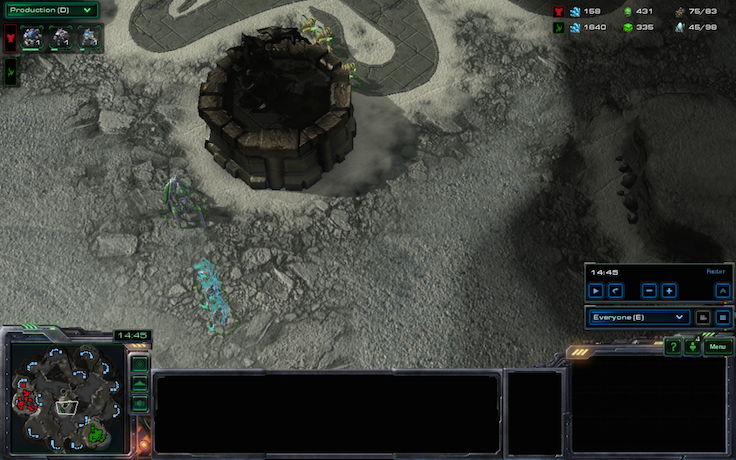 This is why the map is Terran favored, guys. Then the barracks dies, and then two hallucinated colossi shoot at supply depots while the last liftable structure dies to the DTs. And burnout GG's. After the game concluded, TimeTraveler started gloating in burnout's face about how thoroughly he had wrecked him. 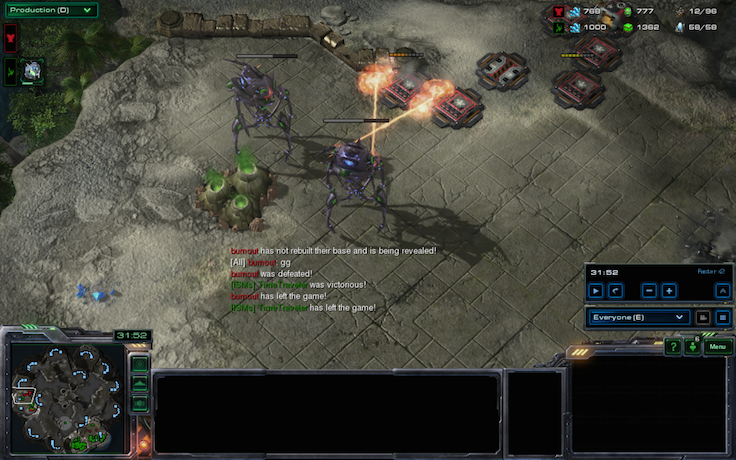 Burnout, who has never beaten a single person at Starcraft II before despite playing numerous 1v1s and practicing against the computer, took great offense. He proclaimed that burnout and TimeTraveler would never face each other, again and despite Vetharest's best attempts at settling the conflict, they remain divided to this day two days later. And thus, one of the greatest rivalries ever to exist in ESPORTS draws to an epic conclusion. Perhaps they will meet in a tournament or on ladder or on Skype or face to face some day. Who knows? They might even continue to play SC2! It could have ended way before it actually did. If DTs were under the Mothership, just a scan wouldn't be enough. You need double detection for double cloak! DAVID KIM!!! See this game! Balance is not there!